British Cycling performance director Dave Brailsford believes Mark Cavendish’s world road race win in Denmark was the product of the best team display in living memory. 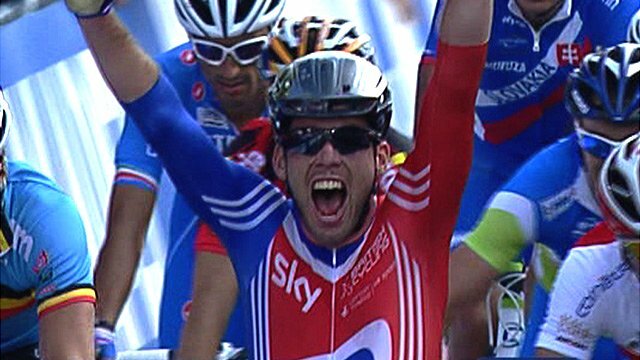 Cavendish became the first British rider to win cycling’s most prestigious one-day race for 46 years on Sunday. His victory margin was a matter of inches but that belies the true extent of the British team’s dominance. “The win is great but it’s how they won that’s so impressive,” said Brailsford. Brailsford’s praise for Cavendish’s seven team-mates is well deserved as the Isle of Man star would not have been in position to do what he does best without them. On a flat course, every other nation knew their best chance was to avoid the kind of bunch sprint “the Manx Missile” has made his own in recent years. So this meant the British team, the strongest ever assembled, had to control the race in Copenhagen from the front of the main pack. The eight-man GB line-up ignored all breakaways to control the peloton over the 165.2-mile (266km) course, delivering Cavendish to the finish in ideal fashion. “You do this by riding very fast for almost six hours,” explained Brailsford. I can’t believe Mark Cavendish managed to deliver with the amount of pressure he’s been under. Britain had to do the work all day, and it beggars belief how he continues to produce finishes. Steve Cummings and Chris Froome laid it down early and then Bradley Wiggins chased the leaders down from the front of the peloton. To go out there, let everyone know your plans in advance, then execute was incredible to see. The British team delivered the result. “Everybody played their part but special credit must go to team captain David Millar for keeping it all together and that final lap by Bradley Wiggins was just incredible. “He rode at about 55kph (34mph) and nobody could go anywhere – they just couldn’t get past him. Brailsford, who also runs the Team Sky professional team Cavendish is expected to join next year, said this was probably British Cycling’s greatest triumph. “We have had a lot of success on the track, in BMX, in downhill mountain bikes and so on, but the men’s road race is massive,” said Brailsford. How big can UK cycling get?